The proportion of people aged 60 and up is growing faster than any other age group, and no government or business can prosper for long without reckoning with the profound economic and social effects associated with a quickly graying population. But there may be new solutions on the horizon thanks to innovations in geo-spatial demography. In recent years, the European Union launched initiatives aimed at addressing the challenges it faces by being home to the largest proportion of citizens over 60 on the planet. Worldwide, an entire industry (the “silver economy”) has emerged seemingly out of nowhere to sell to pensioners in every income bracket and every country. But where exactly will the elderly live? Without this critical piece of information, building strategies that aim to cater to the elderly—a diverse cohort that includes both those who are infirm as well highly mobile “snowbirds”—will have no chance of successfully meeting their needs. The good news for the silver economy is that a new generation of population dynamics modeling now aspires to transform high-resolution satellite imagery into blueprints of where the elderly—or any age group for that matter—are likely to live in the future. A recent feasibility study funded by the European Space Agency examined this challenge. The preliminary results of this experiment—called AgeSpot—were just unveiled earlier this month. In a nutshell, the team’s job was to predict the number of elderly people (aged 65 and older) living in a given 50 square meter location at any time over the next 20 years. By applying econometric and demographic modeling techniques to census, land-use, and satellite data, the AgeSpot algorithm was taught to find patterns of relationships between humans and their physical surroundings. And, as it turns out, some of these patterns are tremendous predictors of who probably lives next door, two doors down, or five metro stops away. The test site was Vienna, Austria, a mid-sized European city with stable population trends and a wealth of publicly available records. As a preliminary step, AgeSpot’s analytical engine was fed inputs from a number of sources that ultimately enabled it to predict Vienna’s current age distribution at the aggregate level with more than 95 percent degree of precision. Next, the machine was taught to apply this logic to spatial patterns and clues, city block by city block. At the 50-square-meter resolution, AgeSpot could accurately predict the relative and absolute shares of the elderly in each district and neighborhood of the city. In Figure 1, we can see a comparison of census data on the 250 square meter level and results from AgeSpot on the 50 square meter level, enabling a detailed analysis on where elderly live and will be living. At the 50-square-meter resolution, AgeSpot could find city blocks that were likely to have a high concentration of elderly inhabitants. 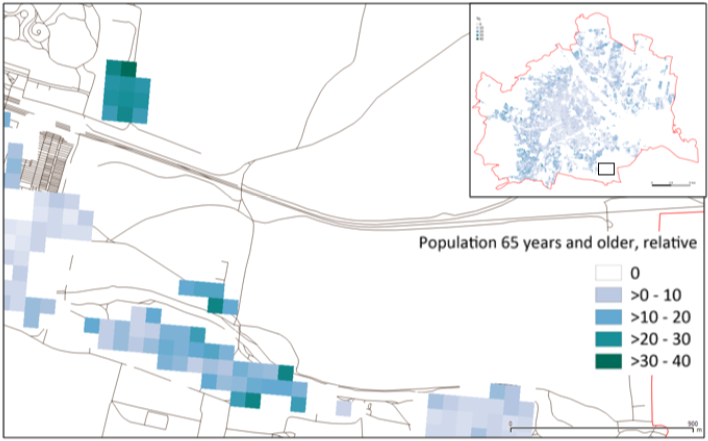 For example, Figure 2 shows AgeSpot’s results when training its steely gaze on a Viennese sub-neighborhood hosting a retirement home for the elderly in its upper left corner (the greener the pixel, the older the population). Going forward, this model can now be deployed in other parts of the world. Adjusting for differences in land-use practices and cultural norms, the project aims to estimate future spatial demographic trends. This is of particular relevance in emerging markets, where societies and economies are changing rapidly, while data systems often remain outdated. For developed countries, the uses are manifold: zoning laws, infrastructure delivery, optimizing branch location and site identification of organizations, social services budgeting, retail chain expansion, and local and regional marketing campaigns. In developing countries where census, public planning, and service delivery are hampered by many constraints, the applications for leveraging these kinds of tools seem limitless. Note: The AgeSpot project was supported by the European Space Agency (ESA/ESTEC Contract Nr. 4000121369/17/UK/ND) and was undertaken as a joint initiative by World Data Lab, GeoVille and Vienna University of Economics and Business. For more information, please contact Kristofer Hamel (World Data Lab, kristofer.hamel@worlddata.io) and Andreas Walli (GeoVille, walli@geoville.com).